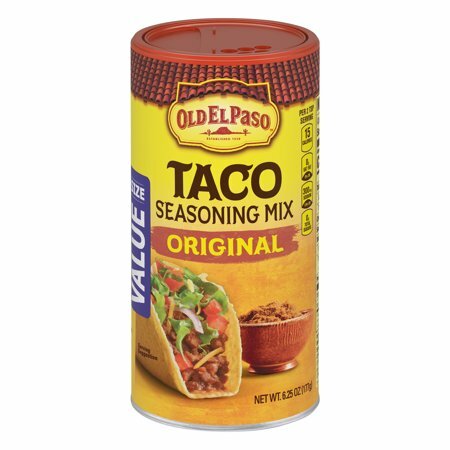 Old El Paso Taco Original Seasoning 6.25 oz Canister. We ❤️ Old El Paso!! I love Old El Paso products! I especially like the canister if seasoning versus the little envelope! With this product You can use as much or as little as you'd like! I would definitely recommend this to my family and friends! We have Mexican at least twice a week!! If you want a little more kick to your flavoring go with Taco Bell brand. This is good, just very mild. I buy these cans instead of packets because sometimes I am feeding one person and sometimes several and with the can you can use more or less as needed. Is there yellow corn meal in the product old El Paso taco seasoning mix? Can&#39;t eat corn. 1. Hi Adrienne - This product contains yellow corn flour. Thanks!